I’m treating this work in a different manner than my summaries of other works because much of the information that Miller has in this work is somewhat superfluous. In my estimation he could have “whittled” down this work by about half, in order to stick to the necessary aspects of the minister’s duties surrounding public prayer. Most books on Pastoral Theology contain mention of the duty of the pastor to preach and to pray. They generally spend considerable time speaking about preaching, and then add in to that praying. Some more than others concentrate a chapter at most on the duty of prayer. Miller has focused an entire 300+ page book on the subject. This does not lessen the importance of the pastoral duty of prayer, it just means that Miller’s work is rather long and verbose on the topic. I’ve decided, then, to only pull from the work the most relevant portions. The pulpit work of a gospel minister is his great work. But public prayer is not to be neglected as a subsidiary work, but another great work of the minister. Miller says, “With a view to justify this estimate it has been said, by those who take this ground, that in prayer we speak directly to God, and implore his blessing; whereas in preaching we listen to the speculations of men exhibiting to us their own opinions of truth and duty.” It is unwise to exalt either of these exercises at the expense of the other. Both are required in the New Testament Church office of Pastor; and both have a value beyond our power to estimate. Presbyterians have written volumes on public preaching; especially concerning the composition and delivery of sermons. Lectures and volumes are almost innumerable and have been lavished on this subject. But how much has been written to aid ministers in the acceptable performance of public prayer! Prayer is a divinely prescribed and unspeakably important ordinance. “But we will give ourselves continually to prayer and to the ministry of the word,” (Acts 6:4). In regard to the best preparation for leading in social, and especially in public prayer, there are two things worthy of particular notice; the one is what has been called the spirit, or grace of prayer; the other is what has been denominated the gift of prayer. By the spirit or grace of prayer, is to be understood that truly devout state of mind which corresponds with the nature and design of the exercise. He has the spirit of prayer who engages in that duty with serious, enlightened, cordial sincerity; with that penitence, faith, love, and holy veneration which become a renewed sinner, in drawing near to God to ask for things agreeable to his will. By the gift of prayer is to be understood that combination of natural and spiritual qualities which enables any one to lead in prayer in a ready, acceptable, impressive, and edifying manner; that suitableness and scriptural propriety of matter, and that ardor, fluency, and felicity of expression which enable any one so to conduct the devotions of others, as to carry with him the judgment, the hearts, and the feelings of all whose mouth he is to the throne of grace. Even in the hands of the most able and pious men, high excellence in public prayer is not, ordinarily, to be attained without much enlightened attention being directed to the acquirement. Prayers in the Old Testament can be seen throughout the book of Psalms, and in various histories, but public prayer is found in 1 Kings 8:22; 2 Chron. 14:11; Isa.37:15; Ezra 9:5-6; 2 Chron. 20:5. They were given by Solomon, Asa, Hezekiah, Ezra, and Jehoshaphat. Public prayer also formed an important part of the service of the Jewish synagogue, that moral institution, which, from an early period, certainly from the time of Ezra, constituted the regular sabbatical worship of the Jewish people. The synagogue service was, in substance, the model of the early Christian Church. The titles and functions of the officers, and the form of worship were the same. In the New Testament, Christ taught his disciples to pray a number of times, and the book of Acts furnishes us with a number of accounts of prayer. Posture in public prayer is not essential. The postures in prayer, as laid down in Scripture and early usage, are four — prostration, kneeling, bowing the head, and standing erect. It is incontrovertibly evident that, for the first three hundred years after Christ, standing in public prayer was the only posture allowed on the Lord’s Day, to the mass of Christian worshippers, who were in a state of union with the Church. In all Presbyterian churches standing is regarded as the appropriate posture in prayer at all times. This posture is recommended by a variety of considerations. (1.) It was evidently the apostolical and primitive plan. (2.) The first General Council, as we have seen, in the fourth century, enjoined it by a solemn canon. (3.) It is a posture expressive of respect and reverence. (4.) It is adapted to keep the worshipper wakeful and attentive; while the postures of kneeling and sitting are both favorable to drowsiness. In the first place, a very common fault is the over frequent recurrence of favorite words, and set forms of expression, however unexceptionable in themselves. 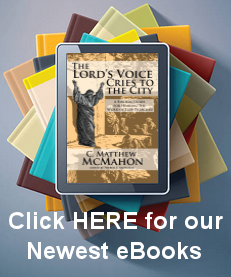 If the constant repetition of the name of the Most High, even in prayer, is not, “taking the name of the Lord our God in vain,” it certainly approaches very near to that sin. Hesitation and apparent embarrassment in utterance, is another fault of very frequent occurrence, and a real blemish in the leader in public devotion. As all prayer is to be regarded as the utterance of the heart, so the suppliant ought to be supposed to be at no loss, to have no hesitation about the blessing which he solicits. When, therefore, he pauses, stumbles, recalls, or goes back to correct, he unavoidably gives pain to every fellow-worshipper, and always leaves the impression of a mind less intent, a heart less fervently engaged, than it ought to be. All stammering, then, all pauses, all recalling or exchanging words, all want of proper fluency ; in short, everything adapted to impair, for a moment, the confidence of fellow-worshippers in the ability of him who leads, to get on with entire ease, comfort, and success, ought to be deemed real faults, and to be as much as possible avoided. All ungrammatical expressions in prayer — all expressions foreign from English idiom, and bordering on the style of cant and whining, low and colloquial phrases, etc., ought to be regarded as blemishes, and to be carefully avoided. Too much detail in particular departments of prayer is another fault of unhappy influence in this part of the public service. Connected with this is the prayer that is too long. Other considerations are, an abundant use of highly figurative language, apparent lack of reverence, praying too quickly, and praying politically. The practice of indulging in wit, humor, or sarcasm in public prayer, is highly objectionable, and ought never to be allowed. One of the most essential excellencies in public prayer is that it abound in the language of the word of God. This language is always right, always safe, and always edifying. Another excellence of a good public prayer is, that it be orderly. That is, that it have a real and perceptible order. Not that it be characterized by formality; not that it be always in the same order; but still that its several parts of adoration, confession, thanksgiving, petition and intercession, should not be jumbled together in careless, inconsiderate mixture. A suitable prayer in the public assembly is dignified and general in its plan, and comprehensive in its requests, without descending to too much detail. Other considerations are that a good public prayer should be carefully guarded, in all its parts, against undue prolixity, should have some variety, and should make mention of the spread of the Gospel. It is important to add, that the whole manner of uttering a public prayer should be in accordance with the humble, filial, affectionate, yet reverential spirit, which ought to characterize the prayer itself throughout. It would seem, from 1 Cor. 14:16, that it was customary in the Apostolic Church for those who united in prayer, to signify their assent to what had been uttered, by saying Amen, at the close. Another means, not so essential, and yet highly important, if any desire to attain excellence in public prayer, is, not only to read, but to study some of the best books which have treated of this subject. Miller mentions Nathaniel Vincent’s work which we have published, “The Spirit of Prayer,” as well as the works of Matthew Henry and his, “Method of Prayer.” Also, Jenks, Bishop Andrews, Bishop Kenn, Bennet, Jeremy Taylor, Scott, and Jay, are among the best. Another means of attaining excellence in public prayer, is to store the mind with the language and the riches of the word of God. A further method of attaining excellence in public prayer, is, when any dispensation of Providence occurs, which appears to demand special attention in the devotions of the sanctuary, to make prompt and special preparation of it presenting that object in public prayer in the most simple, scriptural, and edifying form. The last means of attaining excellence in public prayer is the habit of devotional composition. 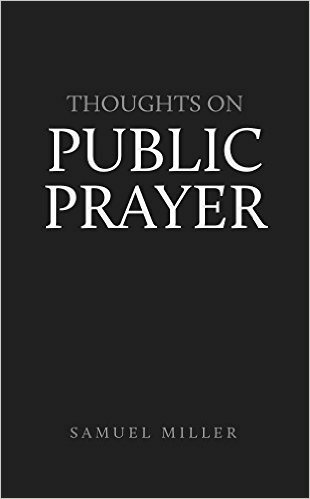 Miller, Samuel, Thoughts on Public Prayer, (Harrisburg, PA: Sprinkle Publications, 1985) 2. Page 45. Many Christian miss the point of this distinction that the early Christian church was not modeled after the temple, but the synagogue. Pages 50-53. Matthew 5-7 in the sermon on the Mount, Luke 11:1, John 16:23-34, etc. Page 56. Acts 6:4, 24; 16:25; 20:36; 21:5. Ibid. See Joshua 7; 5:14; 1 Chron. 21:16; Job 1:20; 2 Chron. 6:3, 13; 2 Chron. 20:5, 13. Page 125. See 1 Kings 8:22; 2 Chron. 6:12; Matthew 6:5; Marks 11:25.